By the time these were printed, only Hawaii, New Mexico, Alaska, and Arizona were still territories. 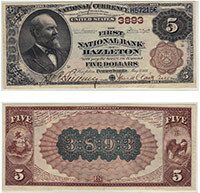 AZ, HI, and NM banks printed this denomination. Some are definitely valuable. The ones from Hawaii are by far the most common. Please contact us if you would like to know what yours is worth. Don't forget to check the serial number. Number 1 notes always sell for nice premiums.